Picture this: a dancer is getting ready to go onstage for her folkloric number. She has the right costume, the right music, she knows the steps and has a dazzling smile. She's all set, right? Not quite. Unless she knows why people dance in the first place, she might as well sit down. What comes first when learning an ethnic dance? Steps and movements: what your feet and body are actually doing in a given time frame (4, 6 counts, etc). To do the steps correctly you must maintain the right posture for that particular dance. (In Mid-eastern Dance, the spine is straight as compared to many other ethnic dance forms.) Correct steps and posture equals good technique. After learning technique, we explore motivation. What is the purpose of the dance within it's culture? You must know why, where, when, and by whom it is danced before attempting to perform it. The integration of all these factors is similar in process to the way actors develop a character, or persona, which brings us to dynamics. What do we mean by "dynamics"? How the persona "feels" will affect every movement in the dance. Is the persona strong and open? Shy and gentle? If it is a group dance, are the members anonymous or are they individualistic? Your movements must reflect these qualities. 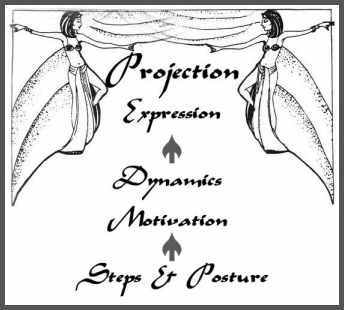 Movement dynamics, as much as costume and steps, are what make a Greek line dance look different from a Ghawazee dance, or a Bedouin dance look different from a Oulid Nail dance. What about eye contact? Again, if you don't know what you're supposed to be telling the audience with your glance, then it's meaningless. And if there are times when it would be too personally distracting to you, then pretend to make eye contact; the fact of it is less important than the impression. If you're a good enough actress, nobody will know the difference. Performing ethnic dance well takes more than knowing the steps and having the right costume. Before stepping on stage, you must become the character of that dance. This is how you communicate with dance, by telling the audience a story they will believe. (1) Ananda Coomaraswamy, La Meri, "Elements of Dance Composition", Arabesque, Vol. VIII #11, p.16.